Visual Applications installation service is our specialty. 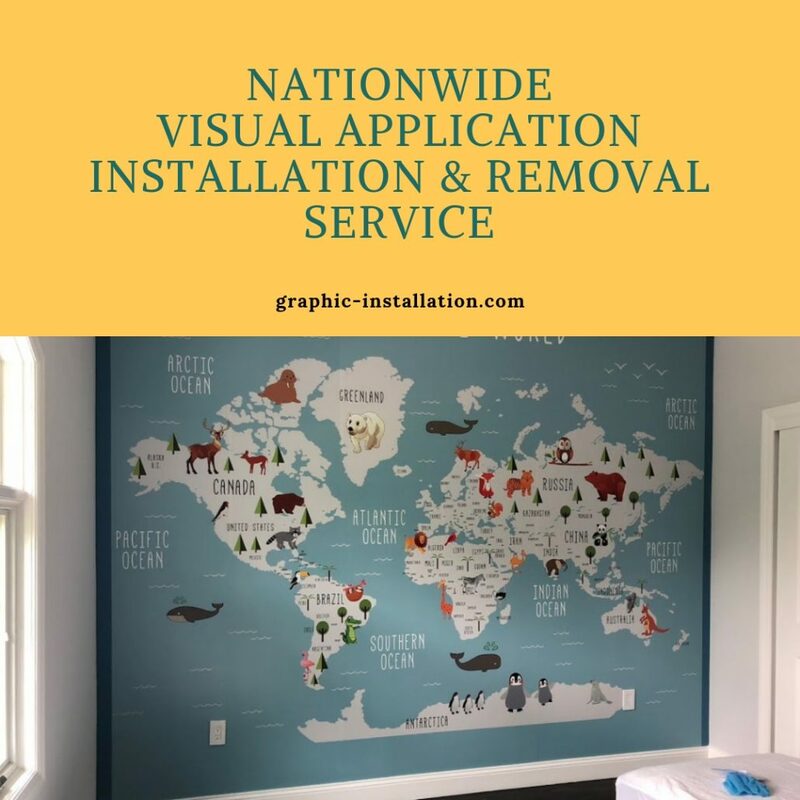 When you need an expert installation and removal visual applications service anywhere in the U.S, make sure to contact Graphic Installation crew. Successfully operating across the U.S. for years, responding quickly to your requests, getting everywhere on time, and providing first-rate quality is what our clients are used to get from us every single time. Whether you need an installation or a removal of any kind of visual applications, contact us, today. Graphic Installation team is the premier visual applications installation and removal service provider in the United States. Whether you use visual applications on vehicles, buildings and walls, signs, and displays, sidewalks or floors, on glass or windows, contact us. We know how to apply and remove all applications in a timely and professional manner. Get the most out of your visual applications, wraps, graphic visual solutions, visual graphic arts, and other types visual design applications. We are a team of professionally trained visual applications installers. Handling the installation and removal of your graphics and making sure they perform their best for years to come is what we do. Our installation crew is professionally trained and certified in both installation and removal of visual applications and any type of graphic visuals. Knowing the significance of both the overall visual applications appearance and the convenience of the installation or removal process enables us to provide the unparalleled service in the U.S.
As soon as the printing process is complete, it is time to call us at (888) 888-5715. This is how you ensure the best final result. Graphic Installation specialists know the significance of your project and understand how important it is to get it right. Even the most appealing graphic visual design applications won’t give you the results you expect if they are not installed in a professional and knowledgeable way. We work and perform in the field nationwide for years and we know how to make your project successful. The highest quality assurance and insured finished product are the guarantees of the quality we deliver continually. Do you need a car, a truck or a fleet wrapping? Do you present a retail business and need a window shop application installed quickly and professionally? Perhaps you are an advertiser and there are a few visual applications to be installed on a building? You can name any kind of graphic visual design and we will always recommend you to call us. No matter the type of vehicles, whether the wall is made of brick or any other kind, regardless of the type of floor, we are specialized and ready to perform the top quality installation on any kind of surface. We realize that the buildings your business occupies, your visual applications and the surfaces you use to show them present an extension of your brand. 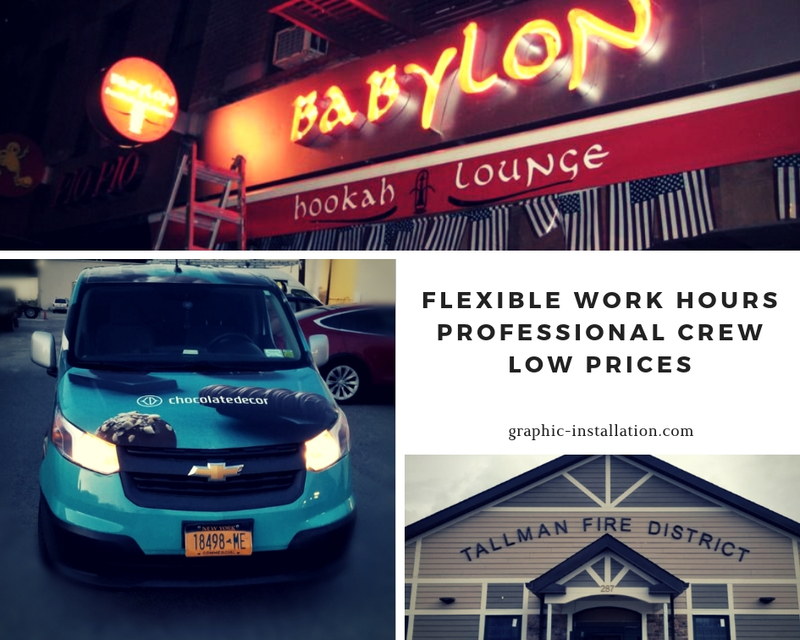 To enhance the quality of customer experience and assist you in building your brand, Graphic Installation crew is ready to provide the best quality installation or removal at any time. Maybe your business uses cars, trucks, or any other kind of vehicles. Regardless of the size of your fleet, we make every vehicle in your fleet a dynamic, moving advertisement. Let our brand turn heads at every corner, on a highway, or in busy streets and crossroads. Intrigue people with the creative graphic visual design. We will make sure you continually do that for as long as possible. We install car wraps and graphics on boats, trucks, vans, trailers, and the whole fleets. Get the attention you deserve, contact us to install your vehicle graphics. If you are a retail business that needs a creative advertisement, glass, window and floor visual applications are perfect to pass on your message and make it obvious. Dress up your window shops and the floors of your retail with decorative and creative visual applications. When you find the perfect window graphic films, a vinyl application, or an ideal 3M graphic visual film, give us a call. From simple glass, window, and floor visual applications, to special effects visual applications, we install them all. We will professionally dress up your retail windows and floors using visual applications of your choice. A whole new world of opportunities will open up before you then. See how quickly we can make that happen. Contact us right away to check out how quickly we can install your retail graphics applications. Wall wraps for both outside and outside, building visual applications, window films… Whatever you imagined, we will make it come true. Wall wrap films and overlaminates, as well as 3M graphic films, can create a stunning appearance. Your wall and building visual applications will look perfect, just like a picture, when we install it. We will install your architectural graphics, buildings and wall visual applications on any surface, even on bricks and highly-textured surfaces. Your visual applications can be as small as a window or large as a whole building. We will install it professionally and in a record time frame anyway. Contact us to get your architectural installation on track. Retail signage, promotional or informational signs, wayfinding signs, or illuminated signs – we will install any. Plus, we do it at an affordable price and within a reasonable timeframe. Do you need it for a longer campaign or for a short-term sale or promotion? We can do it quickly so you don’t lose any customers. Maybe you need to change a sign that gives directions? Or you need to quickly change a sign that gives some other kind of instructions to your customers? Again, we can do it as fast as no one else can. We can also remove the old one cleanly and easily. Whenever you need to get your message or information out with visual applications of any kind, our crew is standing by. We will do the installation professionally and in a timely manner, regardless of the visual applications type or the kind of surface. Our wealthy experience, flexible schedule and installation hours give you a guarantee that the installation will be finished on time, and even sooner. Graphic Installation crew can meet your expectations whenever you need us. Be it on weekends, at any time of day or night, in any part of the U.S. we are here. We will work around your schedule and with your budget to give you the best results. Are you ready to put your visual applications to good use? Let Graphic Installation, a nationwide visual applications installation company, take care of your installation and removal needs. We are happy to assist you immediately over the phone. Feel free to call us at (888) 888-5715 to speak with our team or contact us via the contact form and we will back to you shortly.